SRI-Rice Online is a set of Internet-based resources and user-based assistance services maintained by the SRI International Network and Resources Center (SRI-Rice) at Cornell University. SRI-Rice Online contains the most comprehensive collection of information on the System of Rice Intensification in the world and makes this available free of charge to the global SRI Community as well as the general public. In addition to providing searchable resources and responding to information queries, SRI-Rice Online also publishes reports, articles and documents that come directly from our partners (farmers, researchers, NGOs, government agencies and other stakeholders) who would otherwise not have the opportunity to share their SRI experiences with the world. SRI-Rice Online is comprised of a primary website, three Facebook pages (SICA - América Latina, SRI-Rice and SRI Equipment Exchange), a Twitter feed, the SRI News and Views blog, a Zotero-based research database, the SRI Global News Highlights (ScoopIt newsletter, shown at right), a Slideshare database for presentations, and two YouTube channels (Global and India). The research project "Reducing Inorganic Arsenic Levels in Rice by Appropriate Water Management" was among twelve successful proposals selected by the David R. Atkinson Center for a Sustainable Future to receive funding from the 2014 Academic Venture Fund. The System of Rice Intensification, which recommends moist rather than flooded fields, is one of the water management regimes that will be investigated in regards to its potential to reduce arsenic content in rice. The research team at Cornell will collaborate with overseas partners to test reduced water-use practices associated with SRI in order to determine whether arsenic can be reduced in rice across a range of soils, while maintaining yields. Erika Styger, SRI-Rice Director of Programs, and Linda Roberts, a post-doctoral fellow at Cornell, are facilitating on-station research trials and collection in farmers’ fields with partners in six Indonesia, Malaysia, Mali, Nepal, Philippines, and Sri Lanka . As arsenic is present in different forms with differing levels of toxicity, researchers with Louis Derry’s laboratory at Cornell must first establish analytical procedures to determine arsenic speciation in rice grain. The goal of the project is to save water while ensuring higher long-term yields and producing a safer, more nutritious crop of the world’s most important staple food. In addition to SRI-Rice investigators, Cornell scientists on the award are Louis Derry (Earth and Atmospheric Sciences), Beth Ahner (Biological and Environmental Engineering), John Duxbury (Crop and Soil Science). Read more about the project in the SRI-Rice June 2014 feature article.) An SRI and Arsenic in Rice Workshop (right) was held at the Central Bicol State University of Agriculture, Naga, Philippines, on February 13-15, 2015, to prepare research collaborators from five Asian countries for this project. The primary researchers from Asia together with Erika Styger reconvened on May 24 prior to the SE Asia SRI Regional Conference held in Malaysia to share experiences and further refine their field technique. On April 10, 2015, John Duxbury gave a seminar entitled "Arsenic in Rice - From Field to Fork" at Cornell University. This talk, which is available on YouTube, explains how arsenic gets into rice as well as how it affects both rice and people. ‘Improving and Scaling up the System of Rice Intensification in West Africa’ is the 3-year first phase of a regional World Bank-financed project to increase rice productivity throughout a 13-country Economic Community of West African States (ECOWAS) project area. The project, implemented January 2014 - December 2016, was part of the larger West Africa Agricultural Productivity Program (WAAPP). The CNS-Riz in Mali, which is WAAPP's National Center of Specialization in Rice, collaborated with SRI-Rice to formally launch the ‘Improving and Scaling up the System of Rice Intensification in West Africa’ in 2014. SRI-Rice was responsible for monitoring and evaluation as well as technical support for the project, which includes thirteen countries in West Africa. The first regional technical workshop, cosponsored by SRI-Rice, was held in Kpalimé, Togo, August 4-10, 2014. A second regional workshop took place in Abidjan, Cote d'Ivoire, February 16-19, 2015. SRI-Rice also developed the SRI-WAAPP project's website (in English and French), produced technical manuals in French and English and has developed a map of the major SRI training and field sites in the ECOWAS region. A facebook page maintained by SRI-Rice helps link the SRI-WAAPP farmers with those throughout the region who are interested in SRI. By the end of the project, 50,048 farmers (33% women) were growing SRI rice at 1,088 sites on 13,944 hectares in 13 countries. (For additional details, see the following: Key results of SRI-WAAPP Project’s 1st phase (2014-2016) (see also French version), the SRI-Rice feature on the SRI-WAAPP project and the project website.) 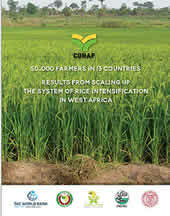 A 2018 120-page book written by Erika Styger (under the Climate Resilient Farming Systems project) and Gaoussou Traoré summarizes the results of the SRI-WAAPP project: 50,000 Farmers in 13 Countries: Results from Scaling up the System of Rice Intensification in West Africa. 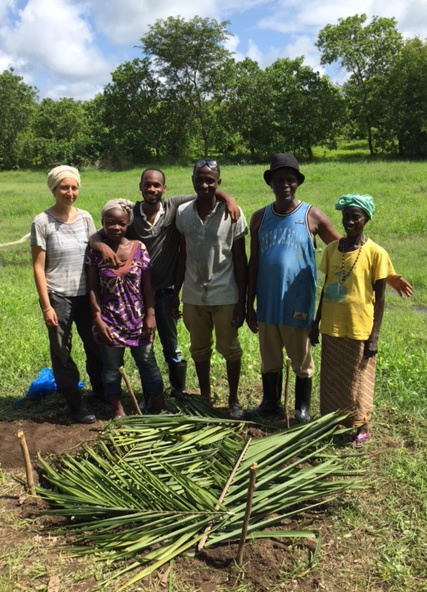 In summer 2016, SRI-Rice team member Hillary Mara partnered with NARSEME, an Guinea NGO intervening in natural resource management and rural livelihoods, to conduct farmer trainings on SRI. In Madina Oula, Kindia region, Hillary and NARSEME field agents led trainings on the SRI methodology and developed two test plots with community members. NARSEME is interested in finding ways for farmers to increase and commercialize their rice production. From 2012 to 2014, SRI trials and scaling up were undertaken near Douentza, Mali, by the Malian NGO "3A-Sahel" in collaboration with SRI Global, Inc. and the Bridging Peace Foundation. The data collection design and data analysis is being assisted by SRI-Rice at Cornell University. Trials were undertaken during 2013 in the villages of Amba, Batouma, Kiro, N'dempaba, Deri, and Douentza, followed by "large-scale" dissemination of SRI from June through December 2013 in the villages of Boré, Falembougou, Manko, Kokoro, Saréféré Mirgna, Koundioume and Sobbo in the Dangol Boré, Djaptodj, and Douentza communes, in the zone of Douentza, Mali. Overall yields using SRI techniques were 51% higher than yields obtained from the usual farmer practices in the area. The project was funded again for a final phase that wrapped up in January 2015. The final report concludes that the average yield increased of 63.36% over the usual farmer practice in the project areas. A follow up project is under consideration. See SRI-Rice Mali page or SRI Global Facebook page for details. The West Africa SRI Network website was developed and is maintained by SRI-Rice in order to provide a platform for sharing knowledge and resources related to SRI in West Africa. The website, which runs on a Ning platform, operates in both French and English. SRI-Rice is a partner on the EU-financed project “Sustaining and Enhancing the Momentum for Innovation and Learning around the System of Rice Intensification (SRI) in the Lower Mekong River Basin.” The main objective of the project led by the Asian Institute of Technology entitled: is to contribute to enhance resilience of rainfed small-scale farmers of Lower Mekong region confronting climate change. 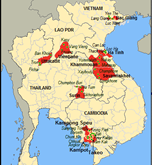 The project implementation period is for 60 months with a total cost of action approximately 3.4 million Euros and involves smallholder farmers in rainfed areas of four LMB countries (Cambodia, Laos, Thailand and Vietnam). It is designed to stimulate local innovation using SRI and Farmers’ Field School (FFS) approacheso sustainably improve agricultural productivity and food security in the context of climate change adaptation, and to enhance research capacities to continue to support this development. The Latin America Initiative is a collaborative project of SRI-Rice and the NGOs SRI Global and Earth Links. The present initiative was built upon a workshop cosponsored by SRI-Rice in 2011: The First International Workshop on the System of Rice Intensification (SRI) in Latin America and the Caribbean, which was held at EARTH University in Costa Rica on October 31 - November 1, 2011, brought together groups interested in SRI to discuss how to move forward with evaluating and extending SRI in Latin America. In 2014, a Latin America coordinator, Jorge Orlando Acosta Buitrago, was stationed at the Inter-American Institute for Cooperation on Agriculture (IICA) office in San Jose, Costa Rica. He prepared Spanish language training materials, facilitated SRI (SICA in Spanish) outreach in Latin America, and help IICA to start up and expand its own expansion into SRI. Jorge's work, which concluded in early 2015, was supported by the Bridging Peace Foundation of South Carolina and by Earth Links in California. SRI-Rice currently maintains the Spanish language SRI facebook, SICA America Latina, toghether with IICA. SRI-Rice currently maintains several research databases and bibliographies that allow people throughout the world access to citations (and non-subscription articles) on SRI research. These include a 1) chronological bibliographic listing (journal articles from all countries) and the 3) Zotero SRI Research Network, (previously at Mendeley) which has a forum for discussion and groups tagged by topic. SRI-Rice maintains separate research databases and bibliographies for China (chronological bibliography and searchable database) and India (chronological bibliography and searchable database). During June 2015, the primary research database migrated from RefWorks to Zotero, an open-source reference manager with additional discussion features. The SRI Research Network, which was originally relied on a Mendeley platform built with a small grant from the Einuadi Center at Cornell, currently uses a Zotero-based group site that allows access to research metadata and freely available articles, and has additional discussion features that can help researchers to locate one another, discuss methodologies and share resources. Once the SRI Research Network officially opens in mid-20167, it is expected to foster inter-institutional collaboration among scientists in 30+ countries and provide additional resources for those carrying out SRI research. A steering committee met in Bangkok, Thailand, in October 2014, to work on the research network plans. A sub-committee reconvened at the SE Asian SRI Conference in Alor Setar, Malaysia, during May 2015, to review the plans for the network. With assistance of the Olam Prize funds, an SRI Research Network website, newsletter and mailing list are expected to debut during summer 2017. 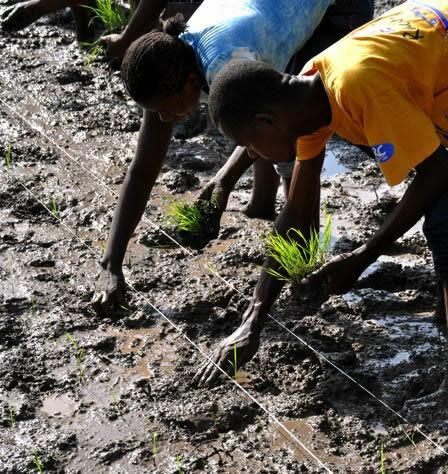 One of the bottlenecks to adoption of SRI in many areas is access to equipment, primarily that needed to carry out planting and weeding operations. This is especially important where labor is expensive or unavailable, or where farmers are already used to mechanized equipment. As SRI methods require changes in some of the conventional rice production practices, equipment must be adapted or invented in order work effectively. For example, weeders (mechanized and manual) have become important as reduced flooding can increase weed growth. And, transplanters must be adapted for use with younger, single seedlings. Other equipment that needs to be invented or adapted includes markers (to indicate correct plant spacing), and in some areas, direct-seeders. Our current project involves 1) facilitation of the SRI Equipment Innovators Exchange, a global Facebook group where over 300 members discuss design, adaptation, and access to SRI equipment, 2) collecting information on designs as well as where and how to access existing SRI equipment worldwide, 3) answering equipment queries, and 4) facilitating meetings and joint projects that help support and build a global community of people working SRI design and access issues. During, 2013, SRI-Rice also worked with the NGO SRI Global and students at Alfred State University in New York to test new design features. SRI-Rice co-sponsored an SRI Equipment Workshop in Bangkok, Thailand, on November 1-3, 2014, which included 60 participants from 12 countries in Asia, Africa and the Americas (see photo at right). The NGO Earth Links and SRI-Rice co-sponsored a side event on SRI equipment during the SE Asia SRI Conference held in Alor Setar, Malaysia, on May 26, 2015. SRI-Rice, Earth Links and the Indian NGO WASSAN are working together to increase access to information on SRI. Most recently, SRI-Rice presented at the Agritechnica, the world's largest agricultural equipment event, in Hanover, Germany, during November 2015. SRI-Rice currently collaborates on building and maintaining the Cornell University-based website on Conservation Agriculture (CA) and its associated research databases and social media (Twitter, YouTube channel, Slideshare, Facebook page, and blog). The CA website links to online searchable research databases in English, Chinese, French, Portuguese and Spanish languages, as well as other resources on CA. During November 2014, the CA project began producing a bimonthly research highlights newsletter. The website also carries Jeff Esdaile's monthly Two-Wheel Tractor Newsletter, which has information on a variety of equipment used for small-scale CA farming. SRI-Rice provides technical support, content management and student oversight for the website. Other partners at Cornell University that collaborate on the Conservation Agriculture Global Research & Resources project include the Mann Library, the Crop and Soil Sciences and International Programs at the College of Agriculture and Life Sciences. The CA website was currently funded by the Howard G. Buffett Foundation through 2018.